RCC and ITEE sponsored three UQ undergraduate students to visit the University of California, San Diego in early 2015 for a two-month stay as part of the QURPA program. Alexia Lee and Zinta Flodine undertook project work within the university's Temporal Dynamics of Learning Center (TDLC), and Troy Smith worked within the San Diego Supercomputer Center. Students Alexia and Zinta wrote the following trip report (please note that iRat is a rat animat robot), and Troy's trip report is further below. Travelling to San Diego as undergraduate researchers was an invaluable experience, both in terms of furthering personal/professional development and the iRat project. Our current work focuses on giving the iRat social behaviours, making it a more effective tool for social interaction studies. I worked on a program that uses computer vision to enable the iRat to follow a rat. This trip has shifted my perspective on many issues, including why interdisciplinary work is critical, what constitutes a good robot and why embodied agents are necessary. My purpose in San Diego was to gain tools for analysing rat-iRat interactions by involvement in running experiments and collaboration with the expertise of the Chiba lab. The experience further exposed me to research culture and enabled me to interact with and learn from a diverse range of scientists within TDLC and UCSD. We would both like to thank you [RCC and ITEE] for providing us with this valuable opportunity. 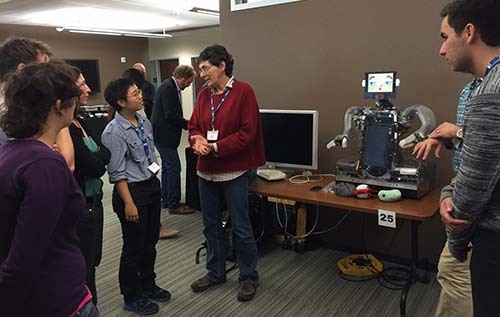 Zinta Flodine (purple jumper) and Alexia Lee (blue shirt) meet TDLC's Dr Deborah Forster (centre) and the robot RUBI at the TDLC annual research meeting. For my QURPA placement, I spent two months working at the San Diego Supercomputer Center at the University of California, San Diego, with Yifeng Cui as my mentor, to use supercomputers in earth sciences applications in the form of two projects. The first project entailed working on earthquake forward modelling code developed at SDSC, which uses GPU code and custom IO libraries to predict the effects of earthquakes, then output the data from the model into a strain tensor for use in engineering. The key achievement from this project was in implementing attenuation effects into the existing model to account for changes in energy in the seismic waves propagating through the earth. The second project was to install the Monash-developed geodynamic program Underworld onto the [supercomputer] Gordon cluster and perform benchmarking tests to evaluate how it performs on larger clusters. The tests were run on up to 128 nodes, or 2048 cores, significantly higher than previous published performance tests. The code was very efficient until more than 64 nodes were used, after which, the performance improvements effectively flattened out. There was also still time to enjoy southern California. The housing for the duration of the program was at the International House, which featured a vibrant community of local and international students. It was rare to find anyone who didn’t understand a second language, or anyone who didn’t show genuine interest in research work. The social life is very active, with regular language tables and region-themed events put on by I-House, and other social activities organised by international students and visiting scholars. This included Superbowl parties on campus, museum trips, movies in the San Diego region and camping trips further afield, the highlight of which was a road trip to the spectacular Yosemite National Park. Overall, the time at UCSD was a great learning experience for coding, HPC and collaborating with other disciplines, supported by a great social community outside of the lab. The next trip to San Diego can’t come soon enough. 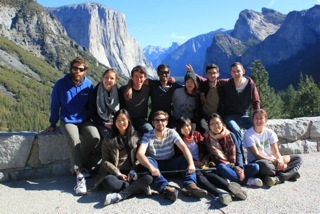 UQ student Troy Smith (back left) in California's Yosemite National Park with fellow students from the University of California, San Diego International House.